I have felt the need to share the details of why the How Does It Feel To Be Adopted? page is PUBLIC and why it’s an ADOPTEE ONLY commenting Facebook “Like” page. Below is what you will find under our “About” section of the page. This area of the How Does It Feel To Be Adopted? page does a pretty good job at explaining things for our followers. After repeated requests to make this a “Private Group” I felt it would be a good idea to focus on a refresher as to why this page is set up the way it is. Bringing the truth to light one click at a time. As we grow closer by the click, this is a place for adoptees to share how it feels to be adopted. THIS IS A PUBLIC PAGE. THIS MEANS WHATEVER YOU SHARE HERE WILL BE ABLE TO SHOW UP ON YOUR TIMELINE. FYI: We are aware that this might cause a privacy concern for some but we also feel that the secrets of adoption have been kept a secret for long enough, and it’s not a secret anymore. We want this to stay public to help raise awareness about adoption from an adoptees perspective. This page is founded for all adoptees that want to express how it feels to be adopted. Your views and opinions matter, and you are not alone. Anyone impacted by adoption can benefit from understanding adoptees better. This page is to help make that happen. We welcome potential adoptive parents, adoptive parents, and biological parents to learn from us because no one can express better than an adoptee, “HOW IT FEELS TO BE ADOPTED”. Announcement: With some careful consideration we have decided to limit the open dialog of communication here to adoptees, and adoptees ONLY. Everyone is welcome here, and we hope you embrace the experiences share by those who have lived being adopted. Forward, questions from non-adoptees will no longer be posted and comments from non adoptees will be deleted. We have set up http://www.facebook.com/askanadoptee1 for non-adoptees to ask adoptees questions. Things have gotten a little out of hand lately, and to all the adoptees who have been triggered by this we apologize. We desire to keep this a safe place for all adoptees. For those who are adoptees AND adoptive parents or biological parents, you are welcome to share here but as we all should keep our sharing focused on our own thoughts and feelings based on our own experiences being an adoptee. We can’t speak for each other. We can only speak for ourselves. We can’t belittle adoptees because we have different views than them. This is a great learning platform for all and the WORLD is allowed to learn from us, this is why the openess of this page is so important. Bringing the darkness to light. Keep in mind we have to respect each others feelings no matter what they are. This change starts now. FYI: Please keep in mind that not all adoptees journeys are those of a positive outcome. Some are just that. This is considered a “SAFE PLACE” for ALL adoptees regardless of how they view their adoption experience. This page is here to offer support, advice, encouragement for every one of us so please be understanding when adoptees have a different view than you. We are each entitled to our own feelings, and they deserve to be heard, and validated. If you always felt alone, you are not alone anymore. This is a wide group of amazing adoptees, and others impacted by adoption. We are here if you need us! •No personal insults to others. •Strong language and vulgarity are prohibited. • Please validate others feelings and allow the negative and positive feelings also to come to the surface, as identifying these issues is the only way we can begin to heal. • Even if you don’t agree with someones opinion or view, please respect that its theirs to have. We all came from different places, and we have no idea what the other person has been through. Feel free to inbox if you have any questions, suggestions, comments or concerns. Adoptees, Please feel free to send any questions you would like asked on the page to the inbox for the page. As many as you would like, and they will be kept anonymous. Also, please share your reunion stories with us! We would love to celebrate the discovery if your history with you! It’s a huge blessing to have each of you here! Each adoptees unique story has tremendous power to promote identity, relationship, and healing. Many people don’t read the about section of the page but we always encourage it. We have also set up page guidelines for all our followers to read and this is pinned to the top of the page for easy viewing. ●Adoptees, Please keep your sharing focused on your own thoughts and feelings based on your own experiences. Page Guidelines & our “About” section of the How Does It Feel To Be Adopted? page listed here for us all. Let’s unpack this a little bit. First things first, this page is not a group. It’s a public “Like” page. It clearly states this in the ABOUT section of the page. The reason this page was originally set up this way is because (as shared in the about section of the page) there is so much secrecy in adoption already I wanted to let the world see our real, raw feelings because our feelings matter, we matter. I get tons of requests to make this a PRIVATE GROUP but it’s impossible to switch a public like page to a private group. Yes, I could make a private group for this page specifically but for me, and the purpose I have in this lifetime I only have a desire to keep things public because I’m tired of being a secret. I’m tired of non-adoptees running our show. I understand fully that some adoptees aren’t able to comment as they wish because they have fears of their adoptive and biological families seeing their truth. I totally understand and I totally get it. I’ve been there. I recommend creating a “Pen Name” (An anonymous name used for writing purposes). I used a pen name for 3 years when I didn’t feel strong enough to share my real true feelings for FEAR of __________ <—- Insert a million reasons here! I get it, I promise I do! That said, there are thousands of adoptees who DO feel comfortable in sharing their truth on this public “Like” page. By all means I suggest any adoptees who are in need of a private group to start one of your own or join one of the many that is already out there and available. There are TONS! Here is a link to one that is moderated by a friend of mine and fellow adoptee, Lawrence Proctor. Make sure you answer the question on why you want to join the group or he won’t accept the invitations. Click this link! Adoptees Anonymous? Who Are We? Why is this page adoptee only commenting? It’s simple. Adoptees are tired of the rest of the world speaking for us, silencing us and not having any safe space to share our feelings. Let me share a little about how the page was created. On October 20, 2012 I was attending a Celebrate Recovery group meeting in Lexington, KY. I was 60+ days in my sobriety journey and I had no where to turn. AA is a wonderful program but it wasn’t what I was looking for because I needed a safe place where I could share my feelings about being adopted and all the hurt and pain I was running from for 27 years. A friend recommended Celebrate Recovery so beginning October I went and continued on a weekly basis. It took me a few weeks to open up and get familiar with the people in my group. I remember like it was yesterday, I started to share something regarding my biological mother and tears began to flow. I started sharing my pain from losing her and a lady to my left whom happened to be an adoptive mother, interrupted me and said, “YOU DON’T KNOW ADOPTION LIKE I KNOW ADOPTION!! !” and she began to tell me her experience with adoption. I was cut off, I was silenced. IT WAS CLEAR THAT ALTHOUGH THIS WAS SUPPOSED TO BE A SAFE PLACE FOR ME ADOPTION WAS THE EXCEPTION. I left in tears, hopeless and even having thoughts of suicide. I was feeling like if this was a Christian Ministry and I was silenced sitting in a small group that was supposed to be a safe space, but not for me the adoptee I had no where to turn. There was no help for me. I went into a depression, was sad and upset for weeks after this. Eventually, after about 3 weeks I went back and I let them know how that impacted me. I let them know it hurt, and it took me to a really dark place. After this, some changes were made regarding cross talk so other peoples feelings weren’t invalidated like mine were, and I spent the next 4 years working through my adoptee issues via Celebrate Recovery. I went on to get leadership training, small group training and I was the small group leader for Women’s Chemical Dependency for almost 3 years. 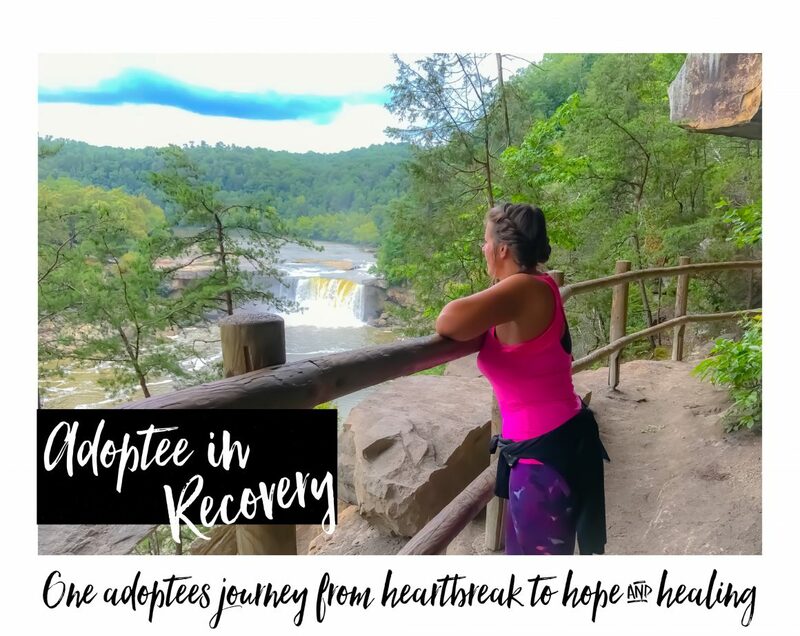 I shared my adoption journey many times by giving my testimony and I was able to get to the root issues of abandonment and rejection from my adoption experience so I could begin to address my issues, and move towards acceptance and healing. This process was critical to my healing process. I learned the dynamics of creating a safe space for everyone to share and how important it is. So please know I have taken careful thought and consideration into creating this page and running it with the flow it has. I realize not everyone will like it and not everyone will agree. I am open to suggestions and feedback, but I’m also limited to what I can do regarding my commitment to the page, and my personal life, etc. For the non-adoptees who might be reading this, don’t you think adoptees deserve a safe space where they can share without you all interrupting us or silencing us? My commitment is 110% to the adoptees, and creating a safe space for THEM to share their feelings. I want them to share whatever level of feelings they feel comfortable with. Have you noticed the other places online where ALL members of the adoption equation are participants how much chaos goes on and how adoptees are silenced by non-adoptees? I refuse to be a part of those pages because they are extremely triggering to me, and I’ve had countless amounts of adoptees say the same thing. I consider it a privileged that non-adoptees are able to sit back and LEARN from us. They can read and reflect and learn. That said, I have also received over the years a high amount of non-adoptees who want to ask adoptees questions. The How Does It Feel To Be Adopted? page is not set up for this to happen. After many months of requests from non-adoptees to ask adoptees questions I created ASK AN ADOPTEE. This page has been an amazing tool in the adoption community. It’s not only given non-adoptees a space to ask questions, but it’s given adoptees the space to share their insight regarding the question, based on their experience living adopted. Please visit the “About Section” for details on the flow of the page. Again, this is an ADOPTEE ONLY commenting space for the same reasons How Does It Feel To Be Adopted Is. How Does It Feel To Be Adopted? and ASK AN ADOPTEE are the ONLY FACEBOOK LIKE PAGES (that I’m aware of) that is set up where the moderator (me) only allows adoptee only commenting. This is because ADOPTEES DESERVE THIS SPACE. Again, I fully understand the way these pages are conducted it might not work for everyone, but I also know it’s working for thousands of adoptees and non-adoptees who want to learn how we feel without commenting, all across the world. I hope this sheds some light on all those who are inquiring about why this isn’t a private group and why adoptees are the only ones who can comment. Previous Is Adoption The Problem OR is Relinquishment The Problem?